Koreans adore their celebrities and some ardent ones constantly try to get their hands on anything stars adorn, including clothes, cosmetics and even medical products. Smart stars not only share, but now offer their own brands. Singer and actor Rain recently announced that he will launch his clothing line, Six to Five, next year, while pop group Wonder Girls and even comedian Park Myung-soo have come out with a cosmetic line and a hair product business, respectively. 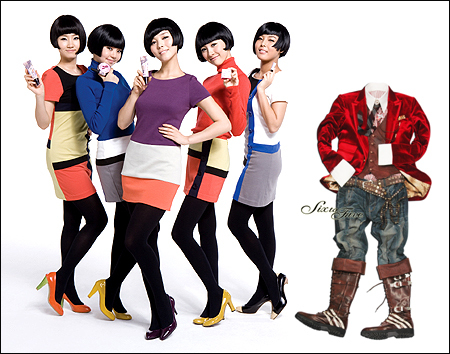 Fashion brand Six to Five was created by Jtune Creative, an affiliate of Rain's agency, Jtune Entertainment. Some of the company's pieces were already presented to the public when Rain wore them at his comeback performance last month. Under the concept ``intelligent vintage,'' Six to Five will bring a trendier wardrobe for fans and fashion lovers. ``With an elegant and formal burgundy velvet jacket, baggy denim and long military boots, we believe Rain's outfit portrayed our concept to the fullest. Simple and classic, but with a hint of vintage,'' Lee Jong-mi from the Jtune Creative design team said. Park Jin-young, the CEO of JYP Entertainment that once nested Rain, brought the five-member Wonder Girls to fans last year and now the girls have something to offer in return. With the help of cosmetic line CLIO, the girls have launched a cosmetic line, Peripera Wonderline. The brand offers six different cosmetic products ― Wonder Ever Pact, Wonder BB Cream, Flash Wonder Base Wonder of Lips, Wonder Shot Blusher and Wonder Duo Mascara and Liner ― each of which the members themselves chose and designed. ``The girls participated in the whole process, from packaging designs, the products and even advertisements, despite their busy schedule,'' JYP Entertainment said. The agency added that the products are targeting young girls who want to try make-up but are cautious in using cosmetic lines that are either too expensive or too heavy to wear everyday. Fans can find Peripera Wonderline through its Web site, www.periperashop.com . Meanwhile, Park Myung-soo, the star comedian from the popular entertainment program ``Infinity Challenge,'' launched his own shopping Web site selling none other than heukchae, a powder product bald people tend to use instead of wigs. Park became the talk of the town with it, leading him to create an Internet shopping mall for men and women who are also worried about their hair lines. The Web site www.geosungmall.com not only offers products certified by Park's experience, but also a counseling corner where users can share their problems with a doctor and other information boards that will come in handy. Stars jumping into their own businesses and appearing in advertisements are nothing new, but some worry about downfalls. Kang Seung-koo, a professor of the department of media arts and sciences at Korea National Open University, said that ``association'' is what brings success and also failure. ``There is a gap between a certain product and the image of a celebrity. The customers think about the image of the star and then try to connect it with the product. If this is not properly done, the product is bound to fail to win the hearts of customers,'' Kang told The Korea Times. The professor also mentioned specialty and professionalism, which are key factors in starting or maintaining a business. Attracting fans with popular stars is one thing, while purchasing and using the product is another. ``In the case of Christian Dior or Benetton, the heads were already famous and talented designers and businessmen, which made their brands reliable. But if you hire a celebrity who has no knowledge or expertise in that certain area, it might bring some attention first, but some customers will start to question the quality,'' he said. The worries should help customers think again before plunging into celebrity products, and also work as a reminder for stars who are considering expanding their stardom into various areas.